Get ready for an awesome, fun, and challenging weekend in the heart of the English Lakes. Discovering the best that the British great outdoors has to offer, and getting plenty of miles (about 30 to be precise) under your belt and taking in some of our most famous peaks. * Please note—all routes are completely weather dependent! Sampling local hospitality, and good night’s sleep. Full day mountain walking — to Scafell Pike via Angle Tarn if weather permits. If poor weather (ie dangerous conditions), an alternative route will be selected. Team dinner and celebration of a successful day on the mountains. 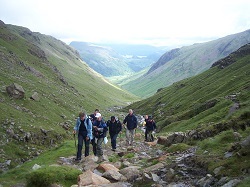 Full day mountain walking —most likely making an exploration of the Langdale Pikes area, including surrounding peaks and crags. Possibly via Dungeon Gill to Pavey Ark and Pike O Stickle, or alternatively over to Bow Fell - this will be discussed amongst the group. Celebrations of a successful weekend and depart for home. Simple basic bunkhouse accommodation is booked for you. If you would like to upgrade to B&B standard then please ask. You will need to bring a towel (if you would like to wash!) and possibly a sleeping bag - TBC in joining instructions. Please advise if you are a vegetarian. 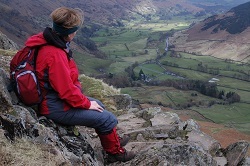 Qualified, experienced & First Aid Trained Mountain Leader throughout the challenge (including safety equipment). At any time of year rain is a distinct possibility, and severe weather a possibility. So wrap up warm, and be ready for anything! – make sure you pack according to the list! Remember that layers are the key, allowing you to adjust your level of warmth more easily. We will almost certainly experience some rain during the weekend, so make sure you have suitable waterproof gear—both top and leggings.